The Sole Administrator of the Rivers State Waste Management Agency (RIWAMA) Chief Felix Obuah, has warned against the indiscriminate dumping of waste within Port Harcourt and it environs, warning that default-er will be made to appear before Sanitation Court as the present administration in the state led by Nyesom Wike is poised to return Port Harcourt to it Garden City status. 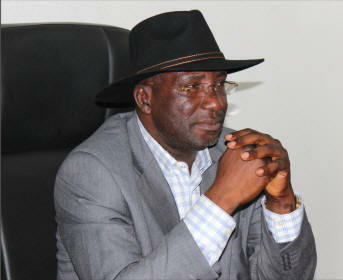 Chief Obuah in a statement signed by his Special Adviser on Media and Publicity, Jerry Needam, said landlords in Rivers State should take advantage of the dry season to clean their environment and discharge their drainage, he noted the fact that it is much more convenient to clean the environment in the dry season than in rainy seasons. According to him un-like the rainy seasons which wetness poses discomfort in cleaning around the houses and surroundings, the dry season enhances unhindered access to all nooks and crannies and leaves no excuse for the clean up the gutters. Chief Obuah who also double as the Chairman of the People Democratic Party (PDP) in the state, also urged landlords to ensure that their tenants are guided and encouraged to clean their immediate environment and ensure that waste are dumped in government approved receptacles. The RIWAMA boss said it is also important for landlords and all residents in the State to avoid dumping waste in the gutters in front or back of their buildings and on the median or indiscriminately to cause blockage of the gutters and other water channels. He said Governor Nyesom Wike is working for the wellbeing of everyone, and would only be proper if well-meaning people, including landlords and their tenants reciprocate the gesture and clean their houses and its en-virons accordingly. Port Harcourt which used to pride itself as the garden city of the country has been defaced by consistent and indiscriminate dumping of refuse along the major roads and street especially Ikwerre road and high populated density Diobu area of the city.